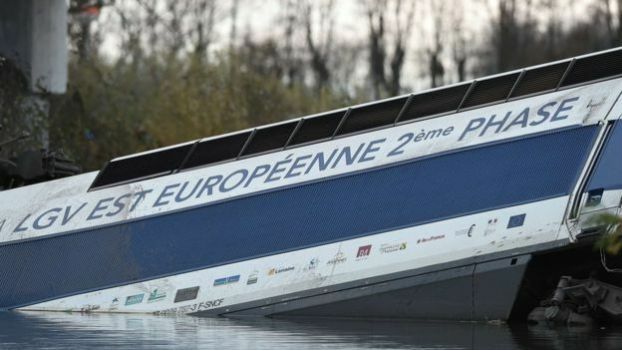 Several children were on board when a high-speed train derailed during a test run in France, killing 11 people, the rail company SNCF has said. Five people are still missing and more than 30 were injured in the TGV crash near the eastern city of Strasbourg. Investigators are trying to determine who the children are and why they were on board when access was meant to be restricted to technicians. It is not clear whether children were among the dead. “That’s not a practice that the SNCF recognises,” said company chief Guillaume Pepy. “A test train is a test train”. SNCF said it was possible that railway workers’ children were on board when the train crashed, reportedly at around 350km/h (217mph). Excessive speed has been blamed for the crash, the first fatal accident since TGV trains began operating in 1981. The train ended up partially submerged in a canal under a bridge.